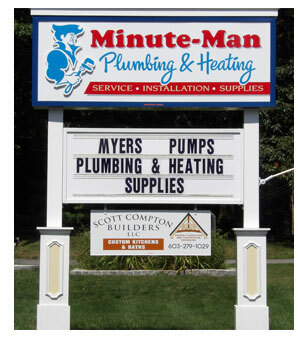 Minuteman Plumbing and Heating is one of the leading plumbing companies in the Lakes Region of NH. When you need plumbing work done properly, such as a simple clogged pipe, or as potentially complicated and sensitive as a piping repair or furnace replacement, Minuteman Plumbing and Heating should be your go to company for quality plumbing work. With many years of combined experience in the field, Minuteman Plumbing and Heating stands out from our competitors because of our attention to detail and our dedication to using the best products and the best equipment for the each and every job. The team of professionals Minuteman Plumbing and Heating understand the value of timely, accurate assessments and precise, effective repairs. At Minuteman Plumbing and Heating we value quality work and prompt, professional service above all else.